The one thing I like about social media is the giveaways. I don't like the "loop giveaways" where you have to like and follow every sponsor, but sometimes companies will run a contest where all you have to do is leave a comment. The ones where you have to tag a friend are tough for me to like, feeling the practice is one step away from chain letters, but I understand the value of lead generation. For the chance to win the right thing, I'll give up a friend's name. And that is how I came to own a DIY Mason Bee House Kit from Mason Bees For Sale. The kit includes everything except glue. I ordered reeds because I didn't realize the kit includes nesting tubes. Putting glue in the precision cut grooves. Attaching the floor. The back is the only part that you have to figure out the positioning for (no grooves for it) but it goes on last and placement is fairly intuitive. It sits inside the walls, making the whole construction sturdy. The kit even includes rubber bands to secure the house while the glue sets. 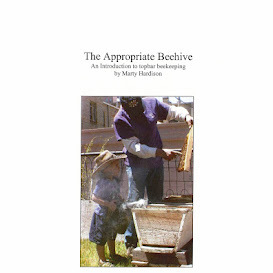 Also included in the kit is a coupon code for 10% off bees. Don't tell them I told you it's MASONBHK17. DIY House packed with phragmite reeds. Tom Theobold has been suggesting that if people want to get into beekeeping an easy way, that they should keep mason bees. He's been selling straws to those of us in the area. This looks like a nice kit if you want to keep mason bees! I built a native bee house based on the plans in the book "The Urban Homestead" by the people who run the rootsimple.com blog that has a few blocks of apple wood with holes drilled in it as well as a bunch of hollow sticks and reeds. I've also been part of the "Bee's Needs" native bee project out of CU and have a bunch of wooden block hives with holes of different sizes. It's been fun to watch the mason and other native bees build fill the holes, emerge and then have a succession of others using them. I think I saw my first mason bee of the season the other day on a dandelion, so the season is starting! SO JELLY @Don! I'm completely blown away by the Bees' Needs citizen scientist project. That and that you personally know Tom Theobold. My masons are flying for sure. Fingers are crossed they think my houses are good choices.